I am a Ph.D. candidate at George Mason University in the department of History and Art History. Currently, I am a graduate research assistant for the NEH-funded Mapping Early American Elections project headed by Sheila Brennan, Lincoln Mullen, and Rosemarie Zagarri. Formerly, I was a graduate teaching assistant for Western Civilization courses and a Digital History Fellow at the Roy Rosenzweig Center for History and New Media. My major field of study is American History with an emphasis on the nineteenth century. My two minor fields are digital history and American religious history. 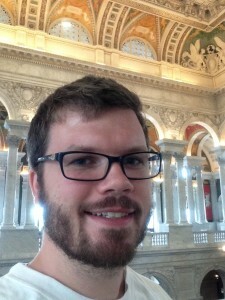 My areas of interest are Mormon history, history of conversion, data analysis, mapping, and digital pedagogy. My dissertation, tentatively titled “The Convert to Zion”: Mormon Conversion and Gathering in the Nineteenth Century, focuses on the conversion experience of Mormon laity across the nineteenth century. Prior to coming to GMU, I received my B.S. in Geography with an emphasis in Geographic Information Systems (GIS) from Brigham Young University. My coursework encompassed human geography, cartographic design, analytical techniques, and programming courses. I also completed a minor in History with my focus on religious history.